Linen and warmer temperatures just go together, right? When I spotted this Rag and Bone Linen on Mood Fabrics site, I knew I had to have it. The fabric is sold by the panel and I ordered 2 panels which was just enough to squeeze out this jacket. Now what to make with this fabulous linen? I found some ideas on Pinterest, mainly unstructured tops with some fun play on the stripes. That seemed like a good idea to start but I wasn't quite sure. Next step was to look through my patterns and I found Vogue 8926 and knew I had found a winner. 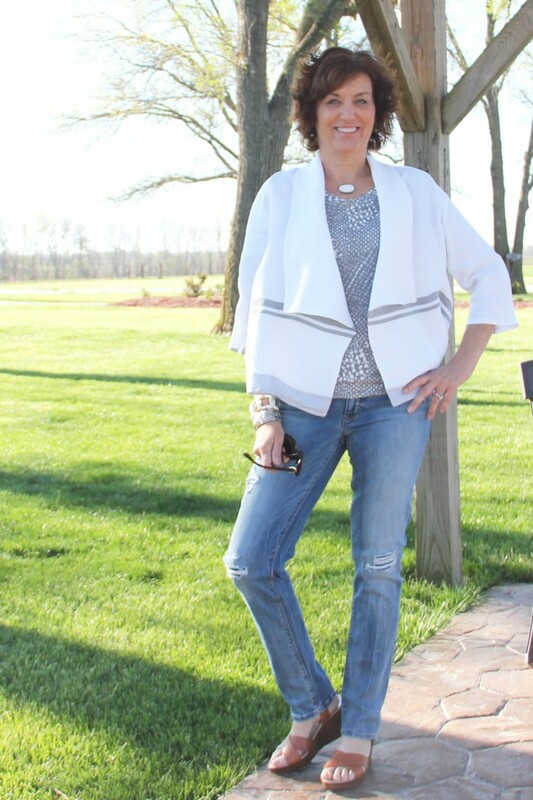 I have several tops that will look great with this linen jacket but this Mood Fabrics' rayon jersey knit was perfect for a casual look. Sewing, it just is my passion and so much of it I like. The purchasing of fabric, selecting pattern, actual sewing is amazing but I also love taking a pattern and making it my own Vogue 8926 was the starting point of my project but making it my own, was starting with that pattern and lovely linen. From that starting point, sewing and creativity lets you turn that pattern into a garment that suits your body style and you lifestyle. This is something I never will get tired of. What about you, what is your favorite part when sewing a new garment? Gorgeous Lori! Great interpretation of this pattern. Ohhh so cute. I love it!!! Once again you've put together great fabric and pattern! Oh, thanks so much, Linda, this one is a favorite. Beautiful jacket and the top is lovely! I love that jacket so much! Brilliant use of the stripes! Thanks so much.Lusty, I really appreciate it. What a great jacket! Love how you placed the stripes. Thanks, Rebecca, the stripes are fun. Great jacket! Linen sure does ravel doesn't it guess we are spoiled with out knits. Thanks so much, we are spoiled with knits but I love my serger and really use it so much. This is a beautiful combination. The linen jacket is really gorgeous! My favorite part has to be matching fabric to pattern. I love fabrics and patterns equally and could spend hours daydreaming about what a fabric can become. Thanks, Ann, it is so fun to pick the right fabric and pattern. Fun and rewarding. Such a gorgeous jacket and top! Thanks, Ann, the Renfrew is a great pattern. Very nice - the stripe on the linen has been placed perfectly. Thank you, Margo, I love it too! This collection is so amazing! I like to wear linen big shirt because it allows me to tuck in, tie up and its look classic with any bottom. The most important reason is I feel really comfortable.